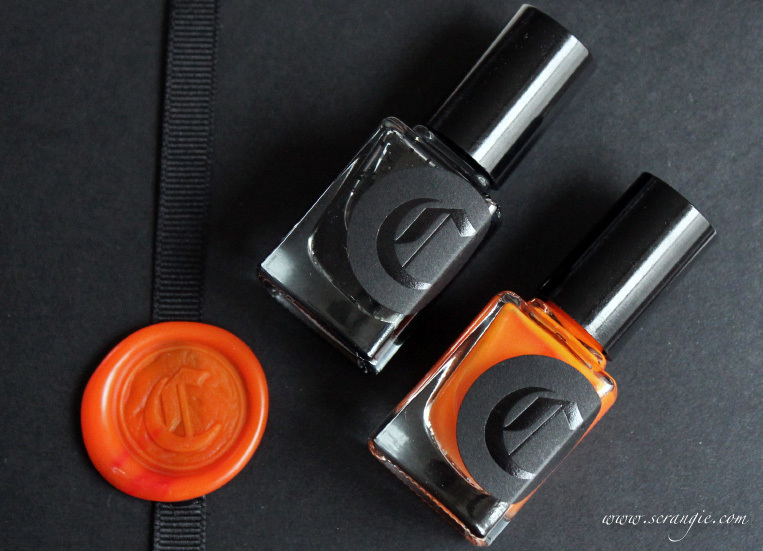 The brand new, limited edition, first ever Cirque Colors Halloween collection comes out today! The collection is called All Hallow's Eve and it consists of two polishes: a glow-in-the-dark orange and a black shattered glitter. They're designed to complement each other when worn together, but can also be layered with other shades to add glitter or glow. Cirque Kabocha. A medium nearly-neon glow-in-the-dark orange jelly. This orange is quite bright, though to my eye it's just a tad short of true day-glow neon orange. It has a jelly finish but it is buildable. I'm wearing three coats here and I still have some visible nail line. 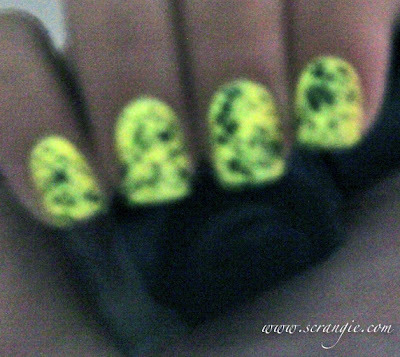 Since it's a glow-in-the-dark polish, it will glow fluorescent green in the dark. Cirque Kabocha, no topcoat. 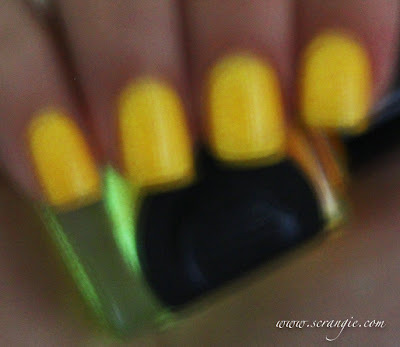 Since this is a glow-in-the-dark polish, it will naturally dry to a semi-matte textured finish. 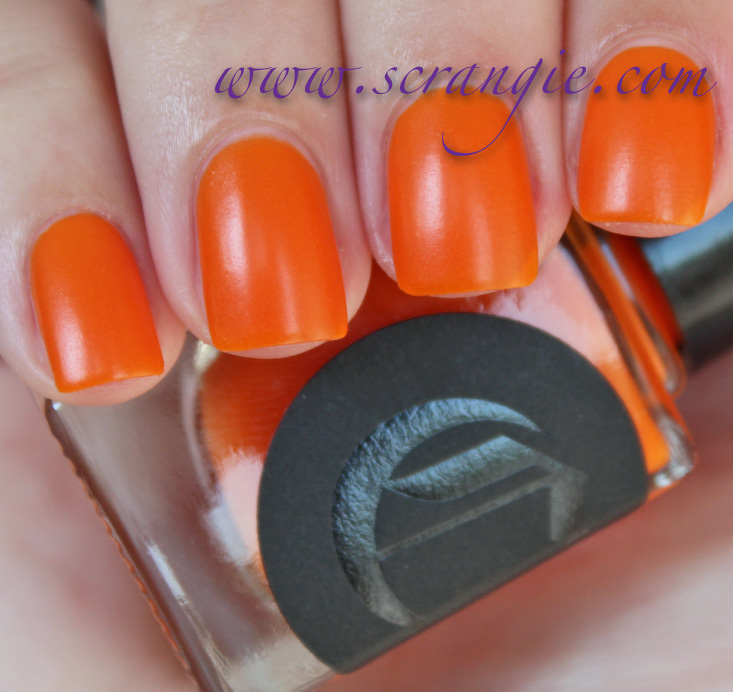 You can actually see the luminescent particles suspended in the orange jelly base and they will add a slight texture to the dried polish. It looks nice this way as well; it reminds me of Illamasqua's rubber finish polishes. I apologize for the hilariously blurry picture. My hands shake so much that it was nearly impossible to hold them still enough to get even this clear of a picture in the dark! Anyway, this is Kabocha on its own. It has quite a strong glow that lasts for several minutes before it needs to be 'charged' (exposing it to light refreshes the glow effect) again. Cirque Neko (one coat over Cirque Kabocha). 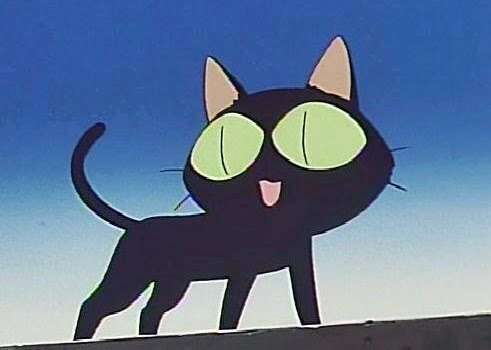 Neko is a black glitter topcoat. It consists of varying shapes and sizes of black glitter suspended in a clear base. Some of the pieces are large and rectangular, some are small and square, some are just jagged and random, some are tiny circles. Very irregular and very interesting looking on the nail and surprisingly easy to apply. The glitter clumps a little, but it's not the type of chunky, clumpy glitter that I have to dab onto my nail to apply. Another cool thing about Neko is that you can still see the shapes in the dark (when you layer it over Kabocha). Sorry I couldn't get a clearer picture of it, but you get the idea, right? The formula on both of these was good. Kabocha is thin and a little watery but goes on smooth and dries quickly. Neko is thicker but easy to apply in a thin coat with good glitter placement. 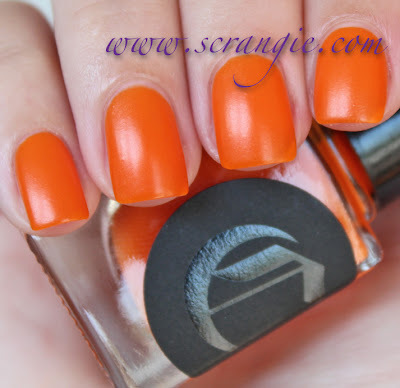 Kabocha is on the sheer side of jelly and still had visible nail line at three coats. Every coat I applied made it more and more opaque, so maybe four would have been perfect. I could have also layered it over a white or orange base to achieve the color and glow effect without having to use multiple coats, but it would have ruined the jelly finish. Neko is a pretty substantial glitter and has some sharp, poky edges, so I needed two coats of topcoat to seal and smooth it completely. Both the polishes need a good, thorough shaking before application as they settle quite a lot (the glow particles in Kabocha settle in the bottom and the glitter in Neko sticks to the sides of the bottle). One more small detail about the formula- all Cirque polishes are scented! It's a subtle scent that reminds me of lavender. It's soothing and spa-like and gives the polishes that extra special 'something'. These polishes are pretty awesome. Kabocha has a nice, strong glow (just be sure to shake it first) and the bright orange color is gorgeous. Neko is interesting and layers very well with Kabocha. It's chunky and pointy but nothing that a couple coats of topcoat won't help. When worn together, Kabocha and Neko are a perfect Halloween combination- black and orange in color with a fun, spooky jagged-shaped glitter and an eerie green glow. 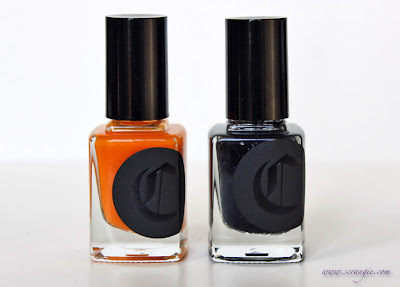 The limited edition Cirque Colors All Hallow's Eve polishes retail for $12 each and are available directly from cirquecolors.com. That orange looks great, and I love how they made it an orange jelly that glows in the dark. You don't see many of those. I also really like the black glitter - really interesting to look at. Hope you're having a lovely long weekend, Scrangie! Are these minis? The price for each one is the same as the price for most of their full size bottles but the bottles look smaller. Omg, Neko hahaha adorable! Such a gorgeous polish, dying to layer it over other colors! Your pics are wonderful as always, but just about everything else about these is hilariously bad. Fail by Cirque, IMO. perfect halloween orange. curious how the glitter would look sandwiched between the orange. Yay! These are on the way to me right now and I can't wait!! I love how you can still see the black shapes when it glows in the dark! Whoa, this glitter is amazing and so unique! I would love to have the black glitter polish! It look so amazing over the nail! *places Cirque order* I just love Halloween, and these colours are just perfect for it! Would these work to make a jelly sandwich? I would love to see that look, but wonder if that glitter is too pointy. They look great together. From a distance the black on top reminds me of bats flying. How would these look work for a jelly sandwich? I would love to see that, but wonder if the glitter is too pointy. I do love how these look together. The black glitter reminds me of bats flying. And I'm digging the combo with the shattered glitter. These are pretty, but at $24+shipping for both, it's too steep for me! I agree and they don't tell you that they are minis either. The bottles looked shorter, no one could answer when I asked here so I compared them to the others on their site (no product in oz there either) and they are definitely minis. 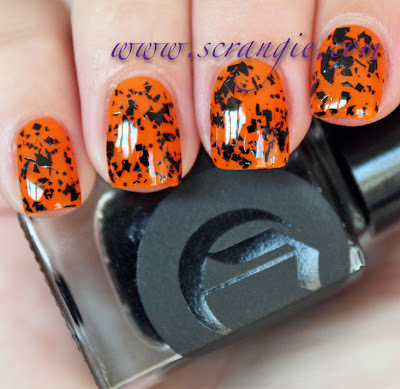 I have so many Halloween polishes I'm keeping my $30 this time. They're not minis, actually- they're the same size as all the other Cirque bottles. But definitely don't spend $30 on them if you don't like them! Thank you for clearing that up Scrangie. It got very confusing for me which is why I asked above, I don't know why these bottles look so different to me but totally my fault and I apologies for any confusing I may have caused. 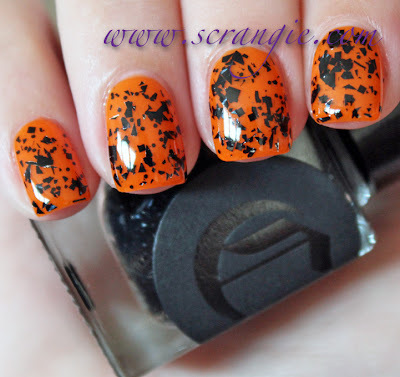 Since you can buy them separately I want to grab that jelly orange and do some stamping over the top. They are really hitting the nail on the head with the jellies, like Tibetan Nights. *sigh* I already have too many of their polishes on my want list though. I agree with Tory...this combo reminds me of bats flying as well!! OMG...thank you so much for pointing out that Cirque polishes are scented. Today is my first time using a Cirque polish ("Dark Horse") and I could not figure out what that smell was! It's not bad I just couldn't figure out where it was coming from. 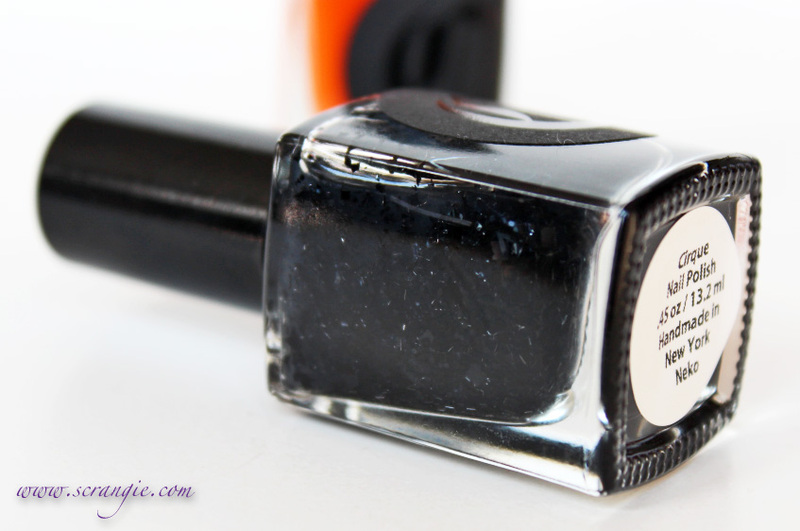 Then I read this post and smelled my nails...it's definitely the polish! LOL! !